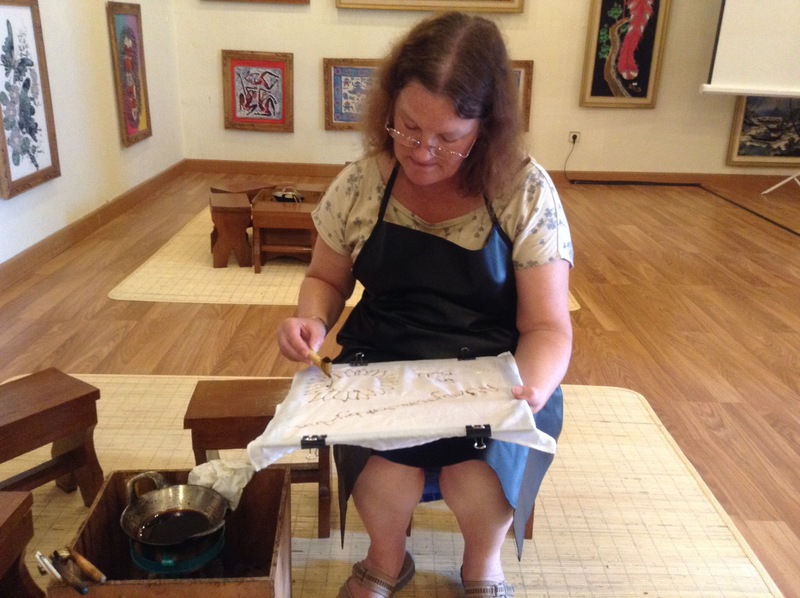 I was excited at the prospects of learning more about Indonesia’s fascination with fabric, and in particular, batik, very much its national treasure, but I don’t think I imagined I’d get the opportunity to do some of my own batik work. Although clearly the best works take a lot of time, imagination and skill, at its simplest level, it was quite do-able, and quite therapeutic. 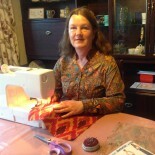 Key tools required are: natural fabric that will take dye – basically cotton or silk. (Probably best to start with cotton), some beeswax and a method of heating it gently, a chanting, of which more shortly, dye(s) and some boiling water to remove the wax. At least that is all that I am hoping is necessary, as those are the basic tools that I expect to use at home. I started with a blank piece of white cotton and a pencil. 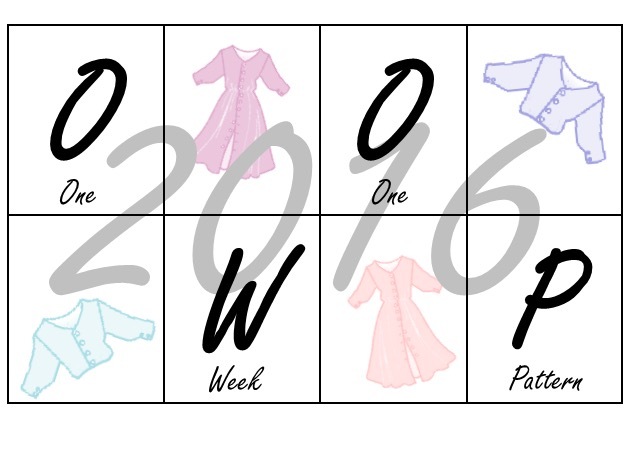 A series of templates were provide to trace, but actually, you can design what you want. 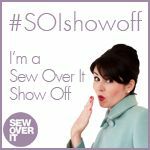 I had a bit of an idea what I wanted to do; my design was to incorporate the web site name, and the decorate the rest of the fabric with template designs. 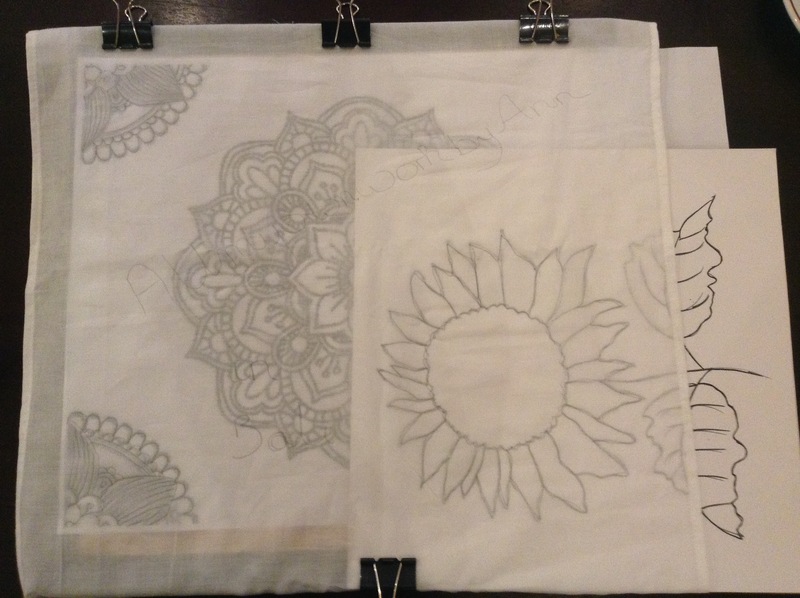 It was quite simple really; I just drew, a bit freehand and a bit of tracing over the templates with pencil. Next, the part that makes it batik. Putting the wax on to the design to create a dye resist area. A study in hard concentration! Then wax is gently heated in a balti like bowl, over a small source of heat. I think the temperature of the wax is probably quite important. I could tell if it was cooling down, which it did on a couple of occasions. The key tool is the chanting, as it is called in Indonesia. This is a pen like implement, with a small reservoir that holds the hot wax, and allows it to gently flow onto the fabric. Straight from the pot it dripped a little bit, but once I touched the fabric, it flowed quite nicely. Hence the concentration, as you need to keep it moving. Shortly after I started, we swapped to a wider nob, so I bought a wider nib chanting to bring home. It cost about £1.50. I thought this was the finished design, but it wasn’t. A thin paint brush was then introduced into the process, and using the wax, I roughly filled in the petals..
On the course I only had a choice of two colours: red or blue. I chose blue. The work of art(!) was plunged into cold water for a short while, and then into the strong blue dye. They said it was strong – I know no more other than it took about 2 minutes to take the dye, whereas I would expect it to take about an hour at home with Dylon. Ready to start dyeing on my course. 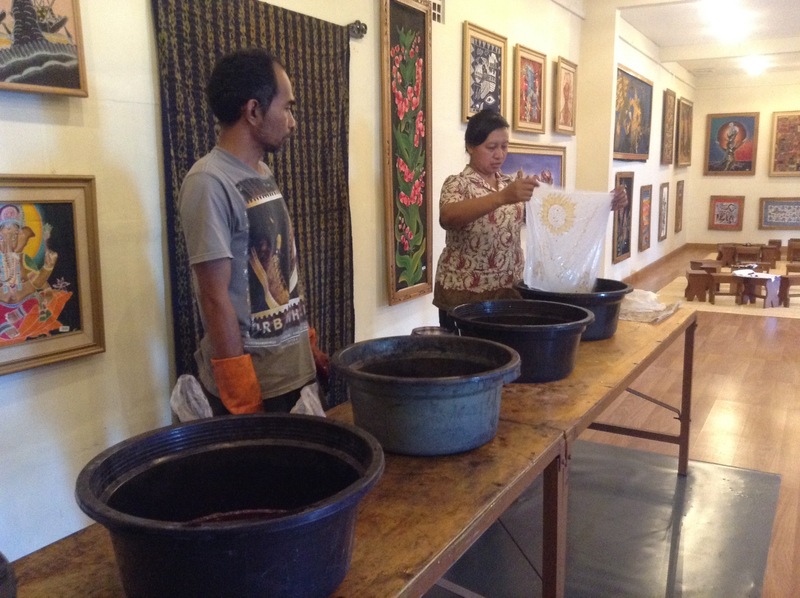 Dyeing on a somewhat larger scale in Jogjakarta, the home of Batik. And after a short period to dry the fabric, I have my finished piece of batik. Which seems to blend very well with my denim skirt! And I also have a certificate to prove it was indeed, allmyownworkbyann! I think that the hardest part of this is getting the colour mixing right. 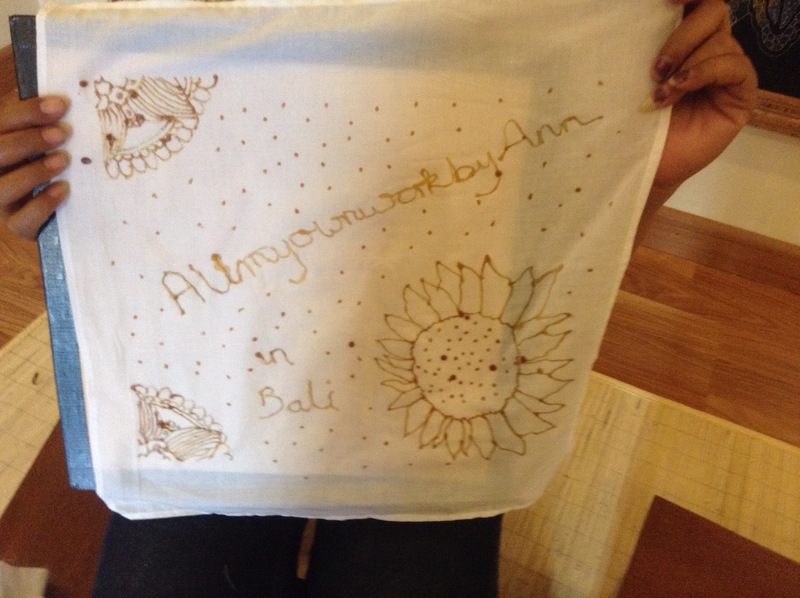 I treated myself to a work of batik art whilst in Jogjakarta. Rice fields and volcanos – absolutely typical of the scenery in Java. I am trying to work out what order the colours were used, and there are only 4 of them. I think the base colour is the white, and probably the burnt amber dye came next. 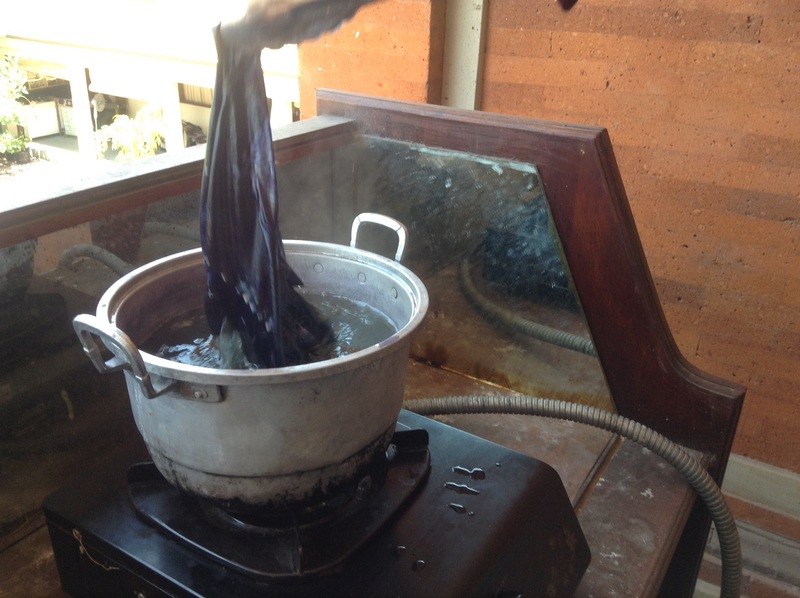 Then another colour was applied and the cloth came out blue, although I am not sure what colour that was. Then presumably the black dye was last. The work is wonderfully detailed, and two sided. Luckily I know a good frame-maker. I have an idea that the frame will be made from a real or mock bamboo. My work doesn’t start to compare, but it did help me appreciate this art work all the better. 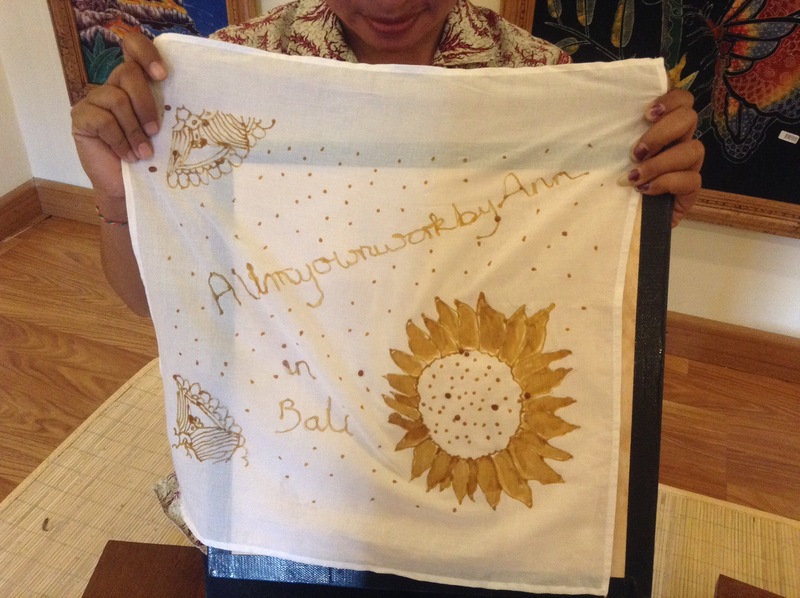 This entry was posted on November 13, 2016 by ann hebden in Batik, Dyeing, Handmade, Indonesia, Wax resist and tagged Batik, Dyeing, Handmade, Indonesia, Textiles, Wax resist.